And it’s true that there is a vast amount of both knowledge and skills for a music student to assimilate. An accomplished musician is expected to have a systematic knowledge and set of abilities in regards to music generally and to their chosen discipline specifically (i.e. technical proficiency on an instrument/voice and mastery of a complex notation system, working knowledge of music theory, history, repertoire, etc.) as well as the ability to apply these skills to varying social circumstances. To be successful, a musician must develop a secure understanding of the rehearsal and performance process both in regards to their own abilities and psychology and in the context of the conventions of making music with others. Much of the content a musician must master is traditionally presented sequentially out of necessity – as in other academic disciplines like mathematics, many musical concepts build upon previous knowledge, and these are the aspects which lend themselves most easily to academic means of assessment, and to codification as standards. But this is only part of what a music teacher does in the classroom, in rehearsal, and what music students learn and experience. Maintain awareness of the physical body, holding a specific posture(s) and performing precise physical techniques to produce sound either with the voice (the breath) or on an instrument (the breath and/or hands and in some cases other parts of the body). Listen: not just to a single object of the attention (e.g. a teacher’s or classmate’s voice), but to the sound they are producing themselves and what those in the ensemble around them are doing (often many different parts or sections of the ensemble doing different things all at once) – constantly adjusting their performance in response to what they hear. With the eyes, interpret visual cues from the director to align their efforts with those of everyone else in the ensemble – constantly adjusting their performance in response to what they see. With the eyes, read and interpret a complex notation system (that they are in the process of learning to understand) that describes what they are to play in real time. Negotiate their own emotional responses to the experience – this can be complex in itself, consisting of multiple layers including response to social experience (subordinating ego to the needs of the ensemble), artistic/intellectual/spiritual response to the music itself, and emotions provoked by the constant process of evaluation, criticism, and the attempt to improve performance that is the daily grind of the rehearsal process. The concentration required to do all of this at once is formidable, and the only other activities a child participates in in school that come close to this level of complexity are in other performing arts: dance and theatre. At its best, musical performance demands a wholehearted attention from the participant, a complete absorption in the moment in which all other thoughts and concerns disappear. The development of the ability to sustain this wholehearted attention takes time and effort for students, and careful cultivation of the learning environment on the part of the teacher. 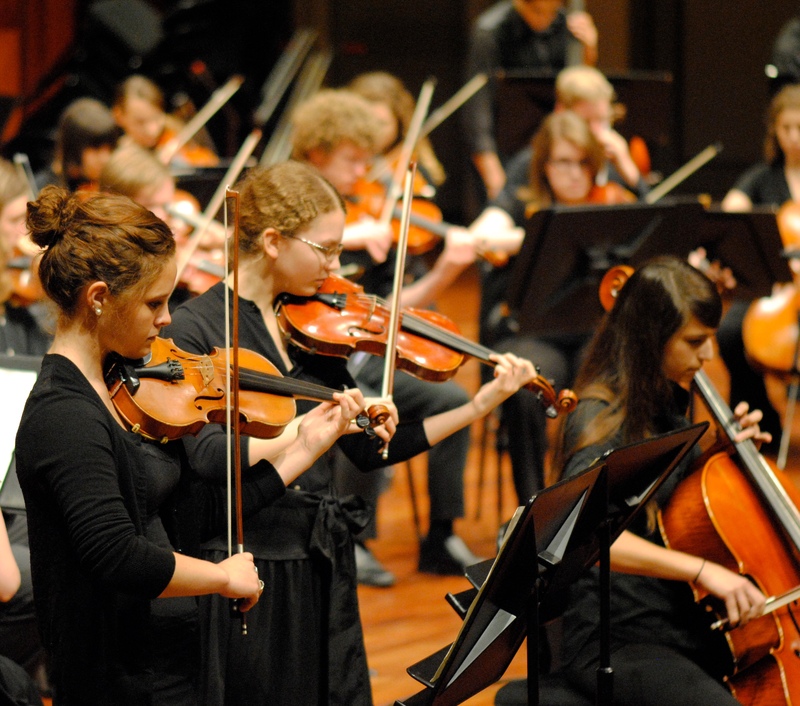 Repertoire must be chosen carefully to present the right challenges for the ever-changing capacities of students, and be artistically worthy of this kind of effort. And the teacher must exhibit this wholehearted attention herself in her work in the classroom, consistently modeling a kind of behavior with which the students may not be familiar, as it is not required of them in the other learning environments they are exposed to. Ultimately, as any fine musician learns, this is the way – the only way to do this difficult work well is to do it with wholehearted attention. My experience as a teacher taught me that – for the vast majority of my students – this kind of effort was something they valued tremendously. Children wish for the opportunity to rise to the demand placed on them in a musical ensemble, to put forth their very best effort right now, in this moment, in making something special happen that is beyond what any one of them could accomplish individually. Participating daily in an activity that required their wholehearted attention brought them a respite from the worries of the day, and the music classroom became a place of refuge and renewal. Musical considerations aside, teaching a child to make a consistent effort to put everything she has into what she is doing right now has the potential for great impact on the kind of people our students will become. In our ever more distracted world, with so many stimuli vying for our attention, the ability to concentrate completely on the present moment seems to be in danger of becoming a scarce commodity. Yet the implications of teaching a child to do this in even one facet of their lives sets an example for how one could live differently. A child who has learned to apply wholehearted attention to one part of life may be able to apply it to other moments when the practice of this kind of attention can have a great impact on themselves and others – when she is faced with difficult emotional or social circumstances, the death of a loved one, or the needs of her own child some day. But even in small ways, this practice of attending to the present moment with all of one’s faculties can bring an experience of freedom, wholeness, and connection to others and the world that is vitally different from the stressed, distracted, multi-tasking state many of us find ourselves in too much of the time. We have all heard and used the common expression “pay attention” but in fact, attention is not a payment, it is a gift. 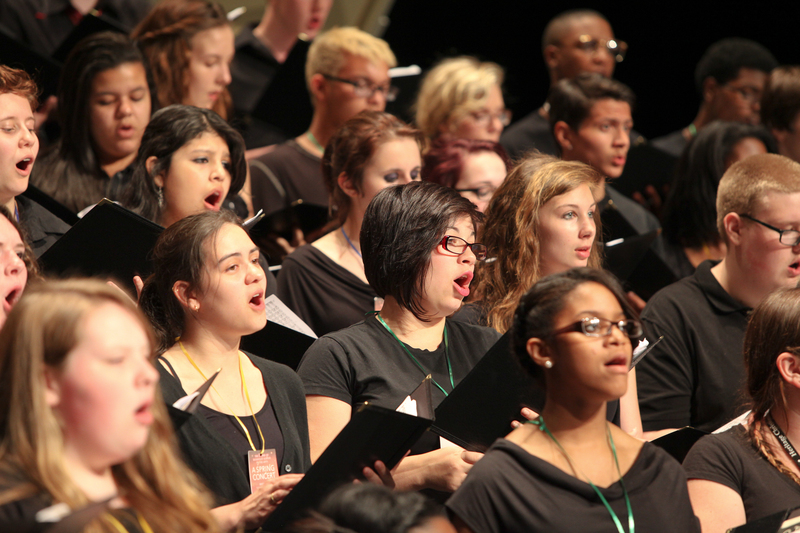 Teaching students to give this gift to their own lives may in the end be the music teacher’s greatest legacy, and the most important thing that students learn in rehearsal and performance, regardless of whether or not they continue to make music as adults. 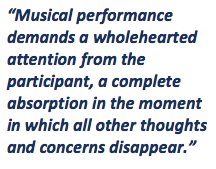 Wholehearted Attention was published on the website of the National Association for Music Education here on May 9, 2016. This article also appeared in the November/December 2016 issue of Choral Director magazine. It was published on the website Teaching With Orff here on December 20, 2018. By walterbitner in Music Education, Philosophy on June 12, 2015 . Thanks for this — good thoughts all. 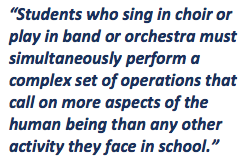 In addition to your comment, “The concentration required to do all of this at once is formidable, and the only other activities a child participates in in school that come close to this level of complexity are in other performing arts: dance and theatre.” I’d add individual and team sports activities, which some students are also lucky enough to participate in. I’ve observed the same characteristics in people who have access to sports as I see in those who have had access to music. Thank you for this, Ros. I disagree. Although sports activities do require formidable concentration, they do not call on nearly as many facets of the human being as artistic and especially musical ones do. Sports activities do not engage the intellectual and emotional sides of the human being anywhere near as richly as artistic activities do. Another distinct difference is that sports activities are competitive by nature, and musical activity is not (although our culture has distorted it to become this way in many educational and professional circumstances). Ensemble music is by nature collaborative. Individual and team sports are built upon the premise of competing against others. Thank you, again, Mr. Bitner.